Angle determines the size of the image of the object formed on the retina of the eye. As shown in the figure on the side, the smaller the size of the object, the lower the angle and hence the lower the size of the image formed on the retina. The small size of the image on the retina is the reason why the eye is difficult to see small objects clearly, even though objects are viewed from a near point, a distance of 25 cm. The loupe or magnifying glass have limited ability to increase the angle because if the size of the object is so small, it is difficult to see using a loupe, then an optical instrument that has a better ability to increase the angle is needed. The optical instrument is an optical microscope. An optical microscope consists of two convex lenses where each convex lens is called the objective lens and the ocular lens. The objective lens functions to increase the size of the image and bring the image closer to the ocular lens so that the angle is more significant. Instead, the ocular lens functions to increase the angle so that the size of the image that formed on the retina is greater. The objective lens is a convex lens. 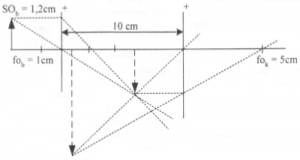 Therefore, the equation of the linear magnification of the objective lens is the same as the equation of the linear magnification of the convex lens. Real images produced by an objective lens are considered objects by the ocular lens. The eyes are accommodated minimum when the ciliary muscles of the eye are in the most relaxed state, and this is achieved if the final image produced by the ocular lens is at infinite. For the final image produced by the ocular lens to be infinite, the real image produced by the objective lens must be at the focal point of the ocular lens. 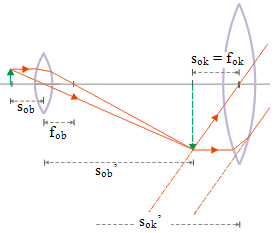 Thus, the distance of the real image from the objective lens (diob) = the distance between the objective lens and the ocular lens (l) – the focal length of the ocular lens (fok). A negative sign is omitted because the negative sign only states the image is inverted. An ocular lens is a convex lens, so the equation for the angular magnification of the ocular lens is the same as the equation of the angular magnification of the convex lens loupe or magnifying glass when the eye is relaxed. 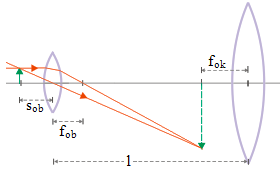 The focal length (f) is changed to the focal length of the ocular lens (fok). 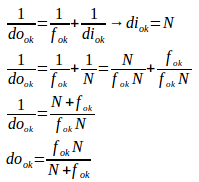 M = the angular magnification, N = the near point of the normal eye, fok = the focal length of the ocular lens. 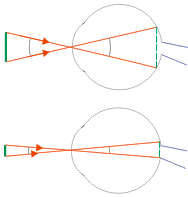 The distance between the two lenses (l) – the focal length of the ocular lens (fok) = the image distance of the objective lens (diob). The object is placed very close to the focal point of the objective lens so that the object distance from the objective lens (doob) is almost the same as the focal length of the objective lens. The final image is virtual, inverted and very far away (at infinite). The infinite distance of the final image does not mean the size of the final image is infinite. The ocular lens is a convex lens, so the equation of the linear magnification of the ocular lens is the same as the equation of the linear magnification of the convex lens. The final image produced by the ocular lens is virtual, so it is given a negative sign. An ocular lens is a convex lens, so the equation of the angular magnification of the ocular lens is the same as the equation of the angular magnification of the loupe (magnifying glass) when eye focused at the near point (accommodation is maximum). M = the angular magnification, N = the near point of the normal eye, f = the focal length of the ocular lens. The total angular magnification is the multiplication of the linear magnification of the objective lens (mob) with the angular magnification of the ocular lens (Mok).